Tattoo Designs & Symbols - nautical star, numbers, native American, nautical, narcissus, tattoos, meanings & explanations of most popular tattoos worldwide. Tattoos for girls and men. Tattoo Designs & Symbols provides tattoo meanings, overviews and explanations of some of the most popular tattoo designs in the world today. 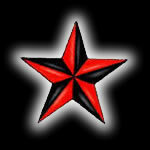 The tattoo symbols & designs on this page all start with the letter N. Some of the most popular tattoo designs and symbols on this page include Nautical Star Tattoo Designs, Number Tattoos, Navy Tattoos, Native American Tattoos, Nautical Tattoos and Narcissus Flower Tattoos. 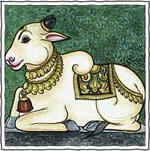 Nandi Tattoos - In most mythologies, the bull is an embodiment of male potency, strength, virility and power. This does not apply to Nandi, however, the bull of the Hindu god, Shiva. Unlike the charged and rampant bulls associated with many other deities - particularly in the Middle-East and the West - Nandi is the embodiment of surrender to the divine, and is considered one of the main symbols of Shiva.